Continuing our expedition into the uncharted realm that the Wild Ones creatures reside in, we stop our jeep to survey the dense landscape. Resting a cup of water on the dashboard, we note ripples spreading across the liquid, the accompanying thunderous footfalls deafening our ears. No, this isn’t an escaped Tyrannosaurus rex rampaging towards us, as those who’ve seen Jurassic Park might suspect. Emerging from the darkness is a different sort of bipedal terror, a monstrosity bred from Eastern influence. Its name is Kaiju, and it is the contribution to Kidrobot‘s first Dunny series of 2018 from Johnny Draco. So who is Johnny Draco? After receiving his Bachelor’s degree in Political Science and Government from Atlanta, Georgia’s Morehouse College, Johnny Miller abandoned the path of his academic learning and decided to focus on his true passions: illustration, painting, animation, and graphic design. Professionally opting to use a nickname given to him by a friend instead of his familial name, Miller thus became Johnny Draco. And since embarking in this new direction, he’s gone on to do freelance design work for companies like Microsoft, Mishka, Adult Swim, and Toshiba, ultimately finding a home at Kidrobot as a senior concept designer. But in the meantime, Draco also pursued creating original art, exploring a style he refers to as “post-pop”. Incorporating a nostalgic cartoon aesthetic with an atmosphere of countercultural cool, Draco’s bold lines and vibrant colors frequently employ wolf characters as simultaneous sources of menace and humor. Having recently conceived one factory-made Dunny design, Mr. Watt (see review here), Draco was prepared to try something different for his Wild Ones series contribution. The Japanese term kaijū typically is used to describe a film genre featuring giant monsters, most recognizably Godzilla, but the word itself roughly translates as “strange beast”. And that is exactly what Draco depicts here. Borrowing some hallmark monstrous traits, like its segmented horns and carnivorous grin, there’s a subtle sign of defiance in the crossed arms (or rather tendrils) at Kaiju‘s waist. And the X on his forehead is a blatantly provocative symbol, immediately reminiscent of Charles Manson‘s similar mark and placement as an emblem of contempt for the legal courts. But Draco softens his creature’s presence through its Muppet-like nose and caricature of villainous eyes, with his signature trio of wrinkles next to each. Primarily adorned in a reptilian green tone, sporadically accented by cartoonishly half circle scales across it, the backside of Kaiju‘s head is “tattooed” with a Dunny skull. And, positioned within a gapping maw, the text on the reverse of this creature’s jacket is Korean in origin, 보스 (or boseu) translating to “boss”, which is what Kaiju surely is. Or, at least, sees himself as. 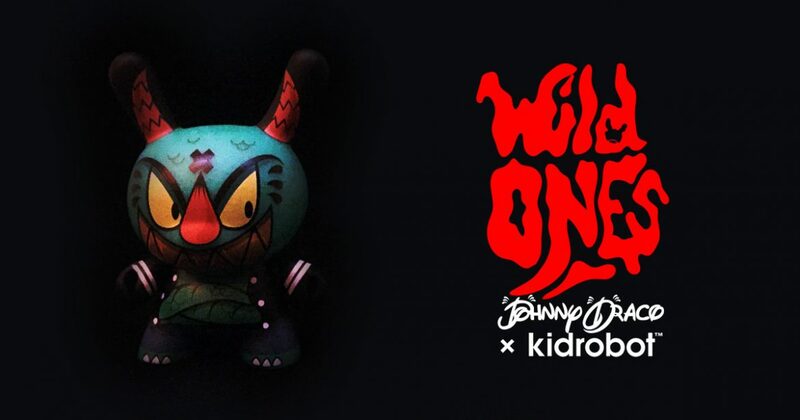 Continue on to Post 4 of 9 in the series “Wild Ones Dunny Series”.